Racing greyhounds live a very different life from the average pound puppy or pure-bred dog. Bred for the industry on farms primarily in the Midwest and South, a greyhound pup’s life is managed from birth. Once weaned, they live with their littermates in large runs where they play and can race up and down, building the endurance, competitive nature, strong bones and muscles for racing. During this time, they interact with people daily and are handled frequently to foster the dog-human bond. At about 16 months, pups begin training. They are first taught to chase a lure and their competitive instinct is encouraged. They’re schooled at a training track where they are acclimated to racing. Dogs that show promise move to one of 23 racetracks across the country. 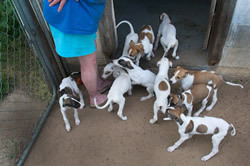 At the track, they live in kennels that can house 40-60 other greyhounds. Each dog has its own large crate with bedding. It spends time, except when being turned out to do its business or going to the track to race, in its crate. Meals vary, depending upon the kennel for which they race. Typically, they eat a mix of raw meat, kibble and other foods such as pasta and cooked vegetables and sometimes supplements. In their early months at the track, developing racers have schooling races where their strength and stamina are encouraged. Those who continue to show promise move on to racing. The length of a racing greyhound's career varies widely. Dogs that don’t perform well retire quickly. Those that remain fit and fast can race for several years. However, the typical age of retirement is three-four. Increasingly, younger, low-achieving dogs are retiring after a brief stint at the track.